1 Aluminum cookware…what is it? 2 What are the benefits of aluminum cookware? 3 Stainless steel cookware…what is it? 4 What are the benefits of stainless steel cookware? 5 Which is most suitable for you? Aluminum is a very popular cookware material as it is pretty cheap to source, as well as being an expert heat conductor. Aluminum cookware is generally dark in color, and often has stainless steel or silicone handles with tempered glass lids. Hard-anodized aluminum: hard-anodized aluminum is aluminum which has been treated to a special process involving acids and electrical currents. This super scientific process causes the aluminum to develop a hard layer on the surface. This hard layer is very strong, scratch-resistant, non-leaching and non-stick. Non-anodized aluminum: aluminum which hasn’t been anodized is softer than hard-anodized aluminum and more prone to leaching when in contact with acidic foods. You’re likely to find non-anodized aluminum as a core inside cookware made from other materials such as stainless steel (which we get onto later!). What are the benefits of aluminum cookware? Great heat conductor: aluminum is one of the best metals for conducting heat, far better than stainless steel, in fact. Aluminum heats up quickly which allows you to get your cooking done faster and more efficiently. Hard and tough (if hard-anodized): hard-anodized aluminum has a hard, tough exterior which is resistant to scratches (not scratch-proof, but very resistant). It’s not going to chip away or peel any time soon, making it a long-lasting cookware investment. Doesn’t react (if hard-anodized): hard-anodized aluminum has the great benefit of being non-reactive to acidic foods. When cooking with tomatoes and citrus, hard-anodized aluminum won’t react and begin to leach metals into the food. (Aluminum which hasn’t been anodized has a risk of reacting and leaching). Heats evenly: not only does aluminum heat quickly and efficiently, it heats evenly across the surface. 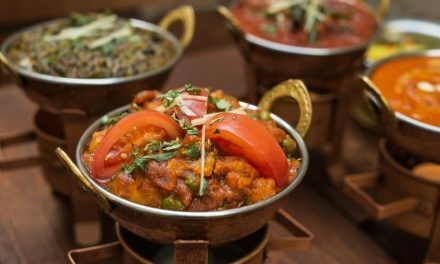 The heat is distributed evenly throughout the cookware, so your food is cooked evenly too. It’s irritating when you have to continuously adjust cookware around the stove to make up for “hot spots!”…aluminum doesn’t have this problem. Affordable: aluminum is an affordable material, and it shows in the market. There are many high-quality hard-anodized cookware sets which offer high-end benefits for low-end prices. Non-stick (if hard-anodized): hard-anodized aluminum has the awesome benefit of having a non-stick surface without the addition of a non-stick coating. This is great because it eliminates the question of chemicals (i.e. PFOA and PTFE) while still providing an easy cooking surface. 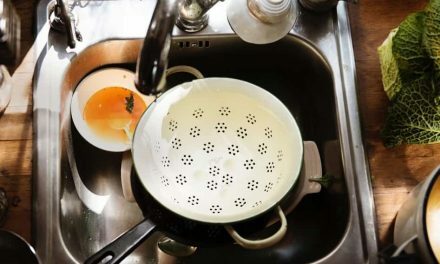 What’s more, non-stick surfaces are far easier to clean as there is less mess left behind! Always a bonus. This is great considering that aluminum is not dishwasher safe, so hand-washing it is. Stainless steel cookware…what is it? Stainless steel is steel which contains chromium. The chromium in the steel reacts with the oxygen in the air to create a hard, oxidized layer on the outside of the metal. This is what we love about stainless steel, as it is scratch-resistant, corrosion-resistant and non-reactive. Stainless steel cookware is either brushed for a matte effect, or left shiny for a reflective effect. Stainless steel cookware will often have full stainless steel lids, or tempered glass lids with stainless steel rims and handles. What are the benefits of stainless steel cookware? Durable: stainless steel is a durable material in the sense that it doesn’t scratch easily, nor does it chip or peel at all. While caring for your cookware is important, you don’t need to be too gentle with stainless steel…it can definitely handle a vigorous, pan-clanging cooking session complete with metal utensils. Oven-safe: stainless steel is totally oven-safe up to 500 degrees Fahrenheit (generally). This is a big bonus for any cookware as it eliminates the need to transfer food from one vessel to another. You can seamlessly cook your dish via stove and oven methods without fuss or extra dishes. Dishwasher-safe: stainless steel should really be hand-washed when possible, but it is dishwasher-safe for those tired nights. Attractive: stainless steel has an attractive, stylish finish which can be see as a feature of your kitchen if you choose to hang your cookware on hooks in the open. It has a certain French-chic appeal to it. 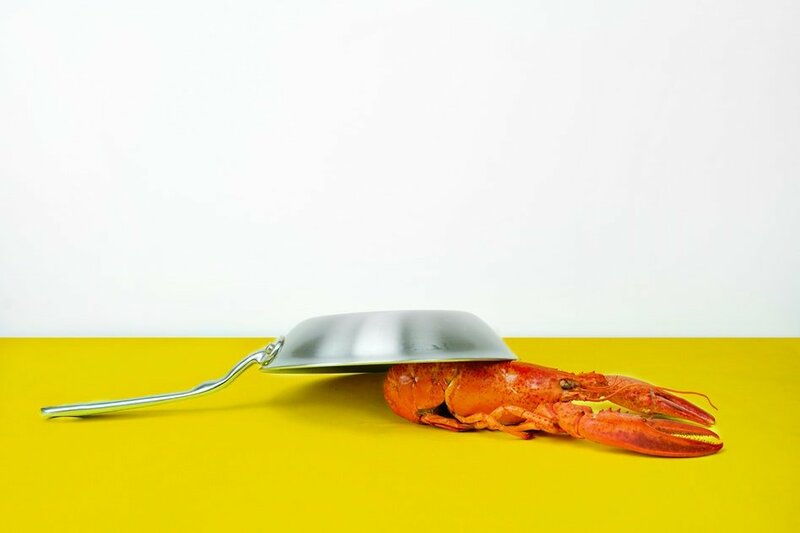 Non-reactive: stainless steel does not react with acidic foods, keeping you safe from metals leaching into your food and adjusting the taste and health profile of the dish. 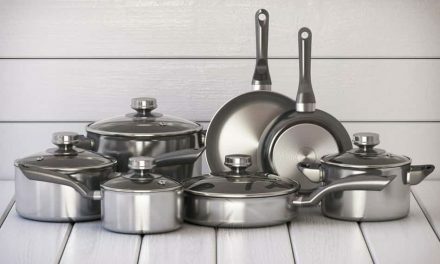 Lightweight: stainless steel is a relatively lightweight material which means you can easily wash, transport and store your cookware without strain. This is great for dishes which need regular tossing and movement. Aesthetics: you may like the deeper, darker look of aluminum over the high-shine showiness of stainless steel. If you like colored cookware, there are some awesome colored sets made from hard-anodized aluminum. Aesthetics won’t affect the cooking…but they will affect your purchasing choice and satisfaction. Heat preferences: aluminum will heat up faster and more evenly than stainless steel. You could find a stainless steel cookware set with an aluminum core to get the benefits of both metals in one. 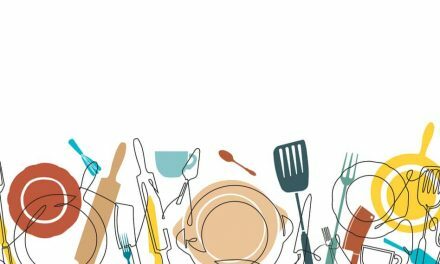 Utensil preferences: stainless steel is more receptive to metal utensils as it is less prone to scratching. It’s best to use softer utensils with aluminum cookware to prevent scratching and exposing the non-treated aluminum beneath. Cleaning preferences: stainless steel is pretty hardy and can withstand a few dishwasher bouts. Aluminum cookware, on the other hand, needs a little more care during cleaning. You shouldn’t put aluminum cookware in the dishwasher, and it should be cleaned with gentle brushes or sponges. This is to avoid discoloration and scratches. Non-stick? If you want a non-stick surface without the hassle of a non-stick coating, hard-anodized aluminum is a good choice. The hard-anodized surface is stick-resistant and is therefore easy to clean and requires less oil when cooking. Cost: this one is dependant on the brand, as there are cheap cookware sets in both stainless steel and aluminum…but the quality does differ. If you want a great stainless-steel cookware set with a base of copper or aluminum you’re looking at a higher price. Whereas there are some pretty fantastic hard-anodized cookware sets out there for a low cost relative to what you receive. You don’t necessarily have to choose between aluminum and stainless steel cookware, you can harness the benefits of both. Why not find a cookware set with a core of aluminum and a shell and surface of stainless steel? That way, you get the shine, non-reactive and hard-wearing surface of stainless steel with the great heat conductivity of aluminum. Whichever material you choose, you’re receiving a great set of benefits to assist you in your home cooking adventures.